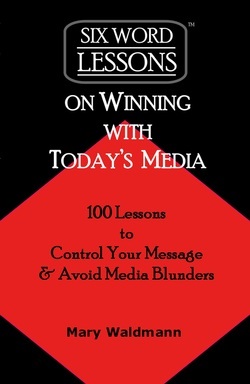 Information-packed lessons for business and community leaders to get your message across and shine with the media! Written by Mary Waldmann, a seasoned PR pro whose long resume includes Public Affairs Director and media spokeswoman for the U.S. Department of Commerce under the Reagan Administration. She parlayed her years of experience into her own company specializing in speech and media communications training and has helped scores of people control their message with the media and avoid the blunders that can tank a career. 1. How do You get News Coverage? Good media relations don't happen accidentally, but require effort. These six-word lessons will teach you everything you need to know to deal with the news media, from the ground rules to insider tips and techniques. Follow them and make your encounters with the news media positive, getting your important message across.